Would it not be great to have a tool that lets you find how different people translate a certain word or phrase? Sketch Engine does exactly that. Sketch Engine can work with bilingual and multilingual texts which means that you can look up a word or phrase and see example translations in context. Sketch Engine contains ready-made parallel corpora in many languages. You can upload your own corpora for example from the translation memory of your CAT tool. After logging in, find a parallel corpus and select it. 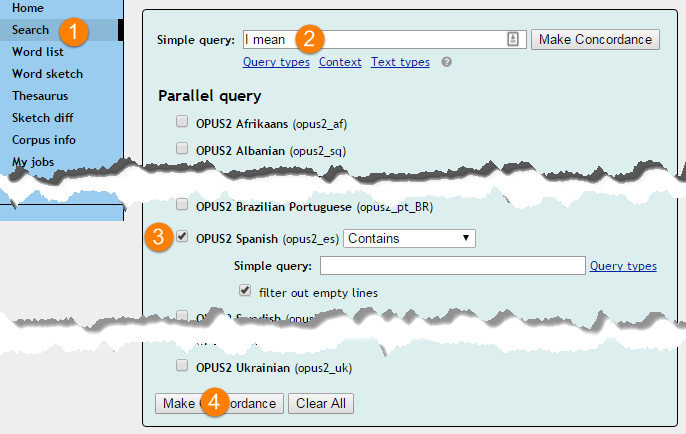 Click (1) Search, (2) type a word or phrase and (3) select a corpus in the target language. A page with sentences in the source language and the corresponding sentences in the target language will be generated within seconds. You may like to click Alignment in the left menu for a different view. There are advanced options to refine the search both on the source and the target language side, for example by specifying some context or by only searching for word or grammatical patterns, not concrete words. To learn more about parallel corpora, please refer to the User manual.